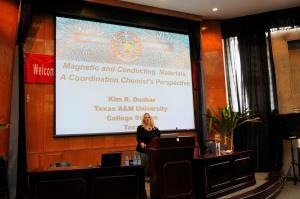 COLLEGE STATION, TEXAS, USA, April 5, 2019 /EINPresswire.com/ -- Kim Renee Dunbar joined the faculty of the Department of Chemistry of Texas A&M in 1999 after serving on the faculty at Michigan State University for 12 years where she was named a University Distinguished Professor in 2006. In 2015, Dunbar received the American Chemical Society’s (ACS) Award for Distinguished Service in the Advancement of Inorganic Chemistry, the second female recipient of the ACS’s top award for inorganic chemistry in its 52-year history and has served as an Associate editor of the ACS inorganic Chemistry journal for many years. A leader in both chemical research and education, Kim Renee Dunbar is the first female Texas A&M Former Students’ Network (WFSN) Eminent Scholar Award winner. In 2012, Kim Renee Dunbar was awarded an honorary doctorate degree from her undergraduate alma mater at Westminster College in New Wilmington in 2012. Prior to that, in 2004, Texas A&M named Kim Renee Dunbar the first Davidson Professor of Science and joint holder of the Davidson Chair in Science, meriting particular distinction as the first female chair holder in the College of Science. Kim Renee Dunbar speaks at events around the world. The Latin American Molecular Magnetism community hosted the 16th International Conference on Molecule-based Magnets – ICMM2018 – in Rio de Janeiro, on September 1st through September 5th 2018. Kim Renee Dunbar gave one of four plenary lectures at the conference and was one of many distinguished scientists from around the world to attend. Kim Dunbar sits on the governing committee as a member of the International Advisory Board. This recognition is due to Kim Renee Dunbar’s great work and research. Kim Renee Dunbar is an internationally recognized expert on synthetic, structural and physical inorganic and bioinorganic chemistry. Much of her work, funded by the National Science Foundation, Department of Energy, the American Chemical Society-Petroleum Research Fund and the Welch Foundation, is focused on problems at the interface of materials and biological chemistry including organocyanide based functional materials, which was featured in an editorial celebrating Women in Chemistry in 2011published in celebration of the International Year of Chemistry. The Basolo Medal is awarded annually by Northwestern University and the Chicago Section of the American Chemical Society in recognition of outstanding research in organic chemistry. The award is named after Frank Basolo, the late Northwestern Charles E. and Emma H. Morrison Emeritus Professor of Chemistry, who made significant contributions to the advancement of inorganic chemistry and served as President of the American Chemical Society in 1983. "I am deeply honored to receive this medal," Dunbar said. "The list of previous recipients include many of my inorganic chemistry idols, mentors and friends. I knew Fred Basolo quite well, and he took an interest in me when I was a young professor. He and I had many long talks, and he regaled me with stories about the history of coordination chemistry. He was a wonderful role model and an inspiration to me."